Earth’s Mightiest Mortal has found his family. It’s probably just as well that the new series didn’t debut sooner. As solid a foundation as those Shazam! backups laid, there was also something slightly off about the portrayal of Billy Batson and his supporting cast. 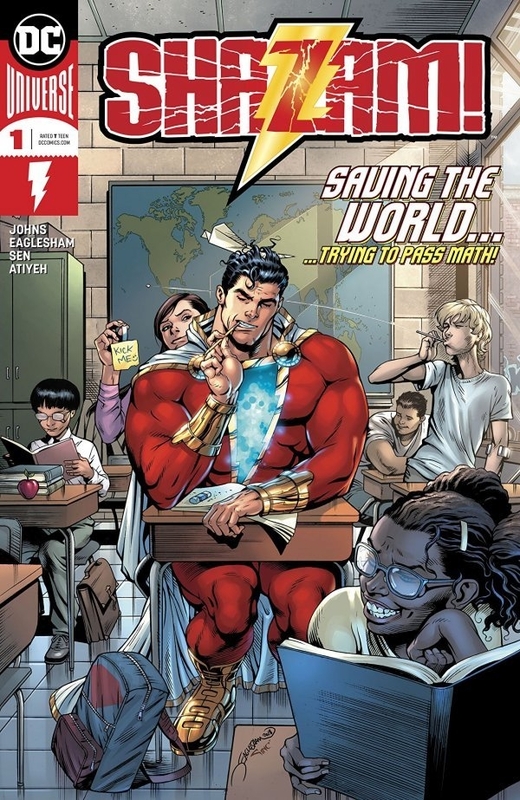 Like so many New 52 projects, Shazam had an unnecessarily harder edge, one that really doesn’t suit a character as goofy and all-age friendly as Billy Batson. If anything, Shazam #1 reads like a comic that could only exist in the relatively more lighthearted DC Rebirth era. Johns’ current take still retains a bit of the previous darkness in terms of the rough background for characters like Mary and Freddie, but he also shows an increased willingness to embrace the campy Golden Age roots of the franchise. Whatever surly meanness Billy Batson might have had in the New 52 has largely melted away. Shazam! #1 serves as a textbook example of how to launch a new series. The opening flashback sequence recaps Billy’s origin succinctly and clearly without boring readers who already know the story and alienating newcomers who don’t need to be dragged into the Shazam deep-end right off the bat. From there, Johns’ script maintains a strong, purposeful pace without attempting to bite off more than it can chew. The emphasis isn’t on building up a world-shattering new conflict for the Billy Batson to confront. Rather, the goal is to explore the core family dynamic and the chaos that ensues from having six underage heroes all vying for attention. The result is a charming addition to DC’s superhero lineup, one that’s as much about the idea of orphans finding a family in each other as it is slapstick humor. This approach does raise a couple concerns. I’m still not entirely sold on the idea of a Shazam Family consisting of six different super-powered teens. That seems a bit excessive, and Billy, Mary and Freddy tend to overshadow their siblings in most scenes. Time will tell how well Johns is able to flesh out the other half of the family. There’s also the fact that setting this series a year after the events of the original Johns/Frank storyline creates problems of its own. With Billy now having had a year to acclimate to his new surroundings, there’s not really any deep, interpersonal friction left. The good news is that Johns seems cognizant of the problem and introduces a new wrinkle late in the issue to potentially counteract it. This first issue features two wildly different but equally effective artists in Dale Eaglesham and Mayo “Sen” Naito. Eaglesham is a natural choice to succeed Frank (who’s currently busy drawing a little comic called Doomsday Clock). He has a similar flair for crafting powerful, detailed figures and cinematic scenes. But even better, there’s an added warmth to Eaglesham’s work that suits the lighthearted tone of the series better than Frank’s style. Eaglesham is able to give the book a modern sensibility even as he reflects a bit of that old-school charm. Sen, by comparison, brings a far more manga-influenced approach to the Mary Marvel-driven backup tale. These pages are clean, expressive and very colorful. The overall effect is charming, even as Naito reflects the very sad undercurrent of the script as Mary leaves behind her abusive household and seeks her destiny elsewhere. It’s great to see a superhero comic that allows for such stylistic versatility. Fans who have been waiting years for Geoff Johns to continue his Shazam revamp can take heart. Shazam! #1 is an excellent start to the new series. It continues the spirit of the original Johns/Frank story while letting in a bit more of the zany fun of the classic Captain Marvel comics. This issue also boasts a much stronger sense of momentum than most.